A valuable lesson was learned yesterday morning. Whatever is uploaded to the internet- becomes fair game to everyone on earth. What I mean is this- no matter what you upload onto the internet- info, PICTURES, etc- you better assume it's fair game for the whole wide world to see, use, copy, say is there's, whatever. I recently did a little search using Kevin + Amanda's tutorial on how to see if your photos are being used on another site. I immediately wished I hadn't. Mine were. Lots were. Mostly, my vanilla bean shortbread cookies. Now I'm no idiot. I KNOW this stuff happens. I sadly read about it occurring to a lot of my blogger friends all the time. My heart breaks for them during each and every story. I read about pictures of their beautiful cakes being used (and claimed!) as someone else's...pictures of friends' kids (yeah, totally serious) being used on certain overseas company t-shirts (true story), and on and on. So, we bloggers watermark. I think I can speak for the majority when I say, we hate watermarking. HATE. It detracts from the picture (which might I add we spent a LONG time working on), it's an eye sore, and it's frustrating to have to add on over and over and over again to every single picture. But we do it because we have hope that we're in some way saving our hard work...even if that hope is small. Watermarking is, in essence, a good thing to do. Don't get me wrong- PLEASE PLEASE watermark your pictures. All of them. Always. If you're a blogger, Facebooker, Instagrammer, Etsy shop owner, or a whatever-er, and you upload pictures to the internet- you might want to start adding your name, your blog, or whatever suits you to each picture from here on out, if you haven't already. People will see your pictures- people you may not intend to see them- and you need to know they could very well be stolen (or claimed as theirs). across my entire image I'd be more safe. I'd of course increase the difficulty of photoshopping off my watermark dramatically and make my picture less likely to be stolen. But honestly- who wants to look at lovely (yes I'm tooting my own horn here, hehe) pictures of ice cream, cakes, pies, or tarts with a fa-huge eye sore of a thing scraping across??? I sure as heck don't. Not on my blog's images and surely not on others' either. It would completely ruin our art! It would makes sites like Pinterest a terrible thing to view. So I choose (as well as many bloggers out there) to create a more subtle-but-totally-there watermark and add it to every picture in a way that allows the reader/viewer to see that it is indeed mine, while still allowing the image to speak. The downfall? My images were and are being stolen, copied, placed on someone else's blog, watermark cropped off, and claimed as their own. Yes, this happened. To me. To other bloggers out there. All the time. People, friends, fellow bloggers- blogging is a community. A friendly place to share your talents and God-given gifts. It's a place to say, "Hey look what I did! Isn't it neat?" or "Hey, this is so yummy, but easy! You can do it too!" It is NOT a place for competition. It is not a place of theft. Were you inspired by someone's recipe or DIY? Awesome! Recreate it, write your own post, take your own pictures, and remember to source back to that original blog post that inspired you. If you love someone's picture so much that you just NEED it on your site- ask them if you can and ALWAYS INCLUDE A LINK REFERENCING BACK TO THEM AND THEIR WEBSITE. Oh, and leave their image as is (watermark included). Don't steal someone else's image. Don't claim it as yours. Don't crop their hard work and remove their very "there for a reason" watermark so that you can use it for your own purpose. Seriously. Don't. Just like, don't. If that's you, and seems like something you're into- you can go back to elementary school where that type of thing flourished. That's not cool. Not for 2013 (or any other time for that matter) and certainly NOT ok in this beautiful blogging community. The intimacy of blogging is threatened. Bloggers feel unsafe to blog openly. Stealing content and images discourages the blogger. Wouldn't you rather be an encourager? Blogging relationships become shaky as we feel we don't know who to trust. Bloggers feel insecure to share their hearts, lives, loves, and arts with the rest of the community. The happiness that is, blogging, gets ripped away from us. Bloggers now, instead of worrying about how to better their arts, have to worry about how to better watermark- meaning their picture quality might be jeopardized. So in conclusion- blog on, bloggers. Please don't let these thieves steal your joy. BUT be smart about blogging- smart about sharing. Blog about your lives, your hearts, your arts- but please know this sort of "theft" is indeed out there. 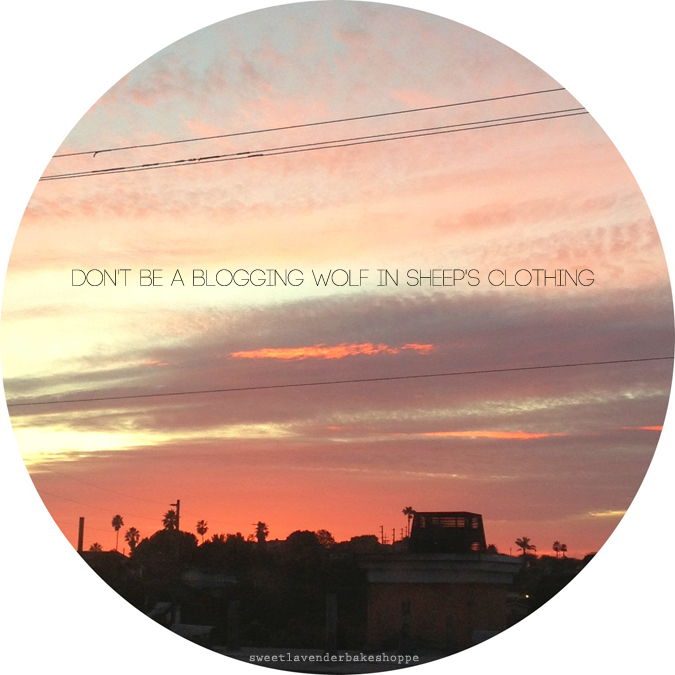 There are for sure blogging wolves in sheep's clothes, so watermark ALL your pictures. If you're courageous enough to make a watermark scan across your photo- more power to you! Share with me how you did it- I'd love to get inspired by you. As for you blog-theives out there- seriously knock it off. Spend the long days, the physically exhausting hours, the sweat and muscle aches, the brain farts and writer's block times- and create your own content. Get inspired by us, sure! Use our ideas- that's why they're out there! But do not steal our pictures or our content. I know how it feels to have your image stolen, name maligned, and family disrespected by others online. It's par for the course. You have to stay above it and create better content when it is stolen. My netiquette rules are the rules of my Grandma Nettie. My mom and Catholic upbringing were major influences as well. Suffice to say that someone copied the name of my website with a book, used similar colors, and then made reference to Grandma's rules being different. I feel your pain. You go sister! This whole thing is very disheartening, but, and unfortunately, it's so very true. Hoping to figure this out with you as well. well put. that is so disheartening. I have heard about many people having their images taken. It makes me sick to think that someone could put Jude's pictures on something. I have debated about watermarking. I try to keep my stamp off to the side. I know many people put it right over the image. It drives me nuts...Thanks for writing about this.